Discussion in 'Lighting and Electrics' started by lieperjp, Jan 29, 2009. This webinar is a crash course on lighting a live music show, from conception to realization. 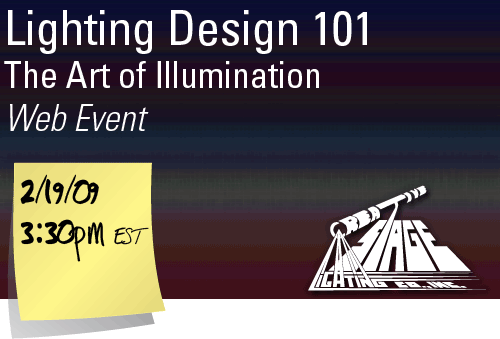 Whether you're an expert or just learning about lighting design, Lighting Design 101 will provide a foundation for building a show from the ground up. Please join us and our presenter, Richard Cadena, for this interesting and informative session that builds on the basics of lighting design and gets you up to speed on some of the latest and greatest technologies in entertainment lighting. Don't miss out on this free session. Sign up today! Note - posted in lighting design forum for higher thread visibility. Sweet! Thanks for the link! Many techs only go so far as to prevent problems that can be blamed on them...I feel it is only right to prevent ANY problem that I can that has the potential to take down a show. Is it not accesible to the linux users amongst us or is linux just not listed? Send [USER]subtonic[/USER] a PM, he works for Creative Stage Lighting and should be able to find out for you. Sorry keeper - We use GoToWebinar for these seminars and I don't think they support Linux. We have been taking past webinars and posting them on our website, so you can watch that space or subscribe to our Podcast to get the session as a screencast. It will not be posted immediately after the webinar - maybe about a week afterwards though. CSL Podcast - Creative Stage Lighting Co., Inc. Still, I'll ask around to confirm if this does or doesn't work on Linux. My gut feeling is that it doesn't. We just tried joining a test session with GoToWebinar on Ubuntu Intrepid Ibex. I'm sorry to report that it doesn't work. The same probably goes for other Linux distros - GTW just asks you to use anything from Windows 2000 or Mac OSX Tiger. But again, this session will be available afterwards as a video file from our website (H.264 .m4v). It will be available after some editing (getting audio levels in control, converting the video, etc). 1. You must know someone with a computer capable of running GTW you could borrow for an hour, or your local library. 2. How do you run frequently-used, industry-standard, programs like Lightwright, VectorWorks, Auto-CAD, WYSIWYG, ESP Vision, and almost all of the lighting console off-line editors that do not run under Linux? During one of my Mac-only phases, I bought a PC specifically so I could run ETC-Edit. [user]Icewolf08[/user], [user]LightingPenguin[/user], others: help this guy out here, please. If anyone here attended the webinar, how did it go for you? Most people had no problems, but a few did. I understand that some people couldn't log in. There were others that could see Richard's slides but didn't get any audio. We're trying to figure out what happened with those attendants. If you had a problem (or even not) please let me know. We're trying to get to the bottom of this and your help would be appreciated. I logged on to watch/hear at 3:30 but the presenter hadn't started by 3:45 so I had to bail on it. When did it end up starting? I didn't attend yesterday's, but had no problems with the previous two. I was on and everything went pretty well. Although, later into the presentation the interference that came through came through very loud, to a point where I couldn't hear the presentation for a period of about 3 minutes or so. All in all, I did enjoy Richard's presentation! One of the points that I really took away that I haven't really brought into consideration until now is to be careful to not reveal the subject too soon. Obviously this has varying degrees of where it applies, but still a great point! I'm a Ubuntu user aswell. Most OLE's work on it, I use software called WINE that allows you to run most Windows programs. Lightwrite works, as does Strands DOS OLE, and the EOS OLE runs under it. I have Windows too though, and I use them both evenly. I also have a Mac so im not OpertingSystem-ist in any way. I was having problems with the background noise, but other than that my audio was fine. The huge delay from when he was talking about the slide and when it actually appeared was annoying - he would talk about a slide and then it would appear 10-30 seconds after he had moved on. Other than that, the presentation was pretty informative. Basic, yes, but informative nevertheless. It was interesting to hear him describe the differences lighting for live audience and lighting for film. Actually, the webinar started on time. The audio was hosed, so you had to dial in via telephone to a different number to hear it. I only caught the last half, but the slides, and last half, were very compelling. They are going to post the video on their website in the next week or so and put a notice on LN when they do. It is definitely worth a review. I logged in right at 2:30 (central) and I got video but not audio. I logged in on a PC, and when I figured out that it wasnt working I tried my mac. I had the same problem on both. I also called to get the audio but still got nothing. I didn't actually sit in during the session, since I will eventually see it since I have to edit it for the CSL Podcast (CSL Podcast - Creative Stage Lighting Co., Inc.). Thanks to everybody here, and even on the LN, who've PMed me or replied to this thread. Frankly, the more I learn about how this went down for people the more I think that we'll never figure out what happened. Lots of people had no problems, and others had the same kinds of problems - and there doesn't seem to be any one thing that separates those 2 groups. Still, we recorded the session, and I'll do what I can to edit out the audio hiccups (it even happened for call-ins?). For everyone who attended - thanks for coming. For everyone who had problems, I'm sorry. I don't know what went wrong. In the meantime, this video of PacMan on some SHOWPIX fixtures will hopefully cheer you up. Huh, what do you know that did cheer me up. Thanks. Got an ETA on when the podcast will be released? Just got the raw video (sorry for the delay) - will work on it this week.